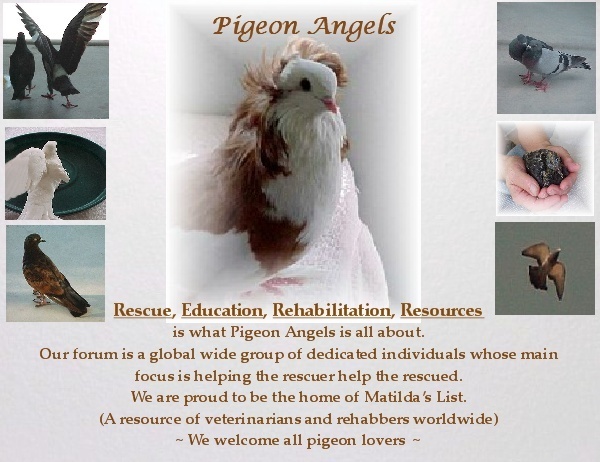 First off let me start by introducing myself; my name is Heather, I am 21 years old, I live in British Columbia Canada, own about 40 or so animals but have never owned a pigeon! This is my first post on here and I am so glad I found this site because I have a tone of questions and have not found too many answers elsewhere. So here is how I ended up with a pigeon. Anyways, I picked up the big guy, put him in a box and took him home. I set him up in a small cat carrier and quickly googled what I could feed him. Scrounged up a mix between my senegals food, my sisters teils food, and some crumbled whole grain bread crust. He devoured the whole dish of food within 2 hours and finished about half the water poor thing. I didnt offer him any more food til the afternoon of the next day. I figured it probably wasnt too good for him to eat that much in such a short time. Initially I didnt think there was really anything wrong with him but now that he has relaxed I am noticing that one wing is every so slightly lower than the other. I have yet to see him fly but the carrier isnt really big enough for it. I was thinking about letting him go for a fly in the hallway so I can assess if he can fly at all and if he can how well but I was also reluctant because I dont want him to cause any further injury to himself, thoughts? I am also wondering if I should maybe wrap it so that its in the right position(I can post better pics of the wing on thursday if needed and post them here), or just leave it? It hangs about 3/4 of a cm lower than the other side. He has white under his beak and sort of half wrapping around both of his eyes. Has bright red feet and white feathers going up his legs part way, and his flight feathers are white. 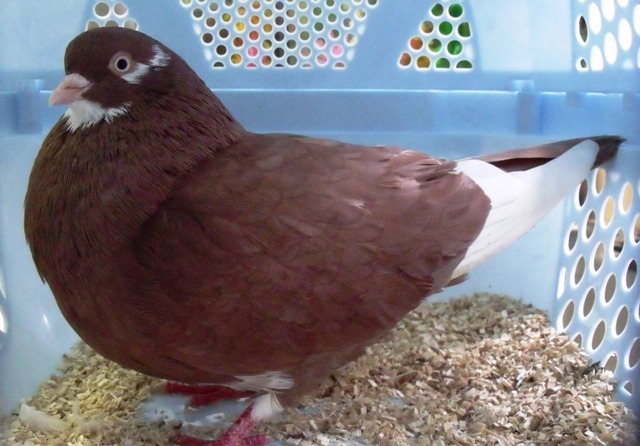 Everything else is a really nice redish brown and hes neck feathers are an iridescent purple in the right light. 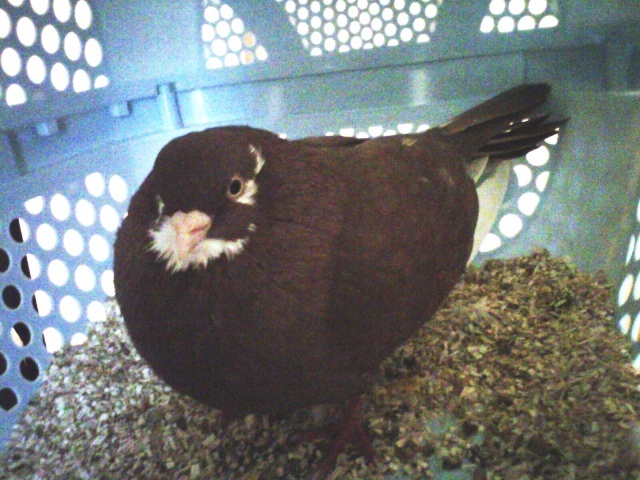 After looking through a ton of pics it is obvious that he is not a wild type pigeon. He is also ok with me handling him and when I change his food and water he doesnt back away or anything. I am thinking he was probably domestic at least at one point. Also not really sure that it is a he, I dont know how to tell but because of his size and the iridescent feathers I am sort of assuming male for the time being. I have decided that I wouldnt mind keeping the little guy and maybe getting him a friend. I have always been interested in pigeons ever since I was little and even almost got talked into purchasing a pair of fantails last year. I moved him into a large carrier today and put a square perch in it. The carrier is obviously temporary. My boyfriend and I are trying to come up with plans that will house 2 birds comfortably as I know pigeons are flock birds and like to be with their own. I will get into the questions I have about housing in a more suitable forum, but he should have more suitable arrangements in two weeks time. What a beautiful little pij. If he had been in that one spot by the door for a week it sounds like you were the only one who had the heart to help him. Many thanks. It's great that you have offered him a home. A companion would be wonderful. With regard to his wing: The ideal situation would be to get him to a vet who is familiar with treating pigeons and have him checked over. I don't know what your situation is so this is just a suggestion. Also, if he has gone for a week or better without treatment, it's possible whatever happened to his wing could be irreversible. It would just have to be checked. You can do an assessment yourself to check to see how his overall health is. 1) Check his keel (breast) bone. There should be a sufficient amount of muscle on each side. In the picture there appears to be, but not sure if that's because he's a little fluffed up. You also mentioned he ate well, so that's a good sign. 2) Check the inside of his mouth. Gently open his beak and take a look. It should be clear and nice and pink. 3) Check his droppings. They should be well formed. A light brown with a bit of white are ideal droppings. If you can pick up a bag of dove mix at a pet store, that would be great. Even wild bird seed will work for a while. Overall, other than the wing issue, it sounds like your little rescue is doing, or at least looks, good. Teresa will be stopping by and will be happy to offer her input. Please do keep us posted and by all means if you have any questions, please don't hesitate to post them. Forgot to mention that I picked him up proper pigeon mix yesterday. I got one from a pet store that was mostly millet and wasnt very happy with it so I went to a tack and feed shop and got, what I think is, a better looking mix. I didnt want to wast the other stuff so I mixed the two half and half. As for the vet, I am going to call around tomorrow to see if anyone will let me get him checked out for free. I wouldnt mind putting him on a general antibiotic if the vet says its ok. I have other birds in the house, he is segregated but I would rather be safe than sorry if he does have some sort of ailment. Such a beautiful pigeon! It's remarkable how lots of other people just passed by without taking any notice... he's gorgeous, and he's very lucky to have found you! There are a number of possibilities for that droopy wing -- an injury (a fracture, a sprain, bruising), or a debilitating illness (often, but not exclusively, Salmonella). On the photo there appear to be some small droppings like the ones Cindy described, which is very good and makes an illness less likely. So at this point I would assume it's an injury. The best would be to have a vet take an X-ray of the wing, that's what I always do in the circumstances. That would tell you for sure if there's a fracture or dislocation, and that would determine the course of treatment. Any fractures need to be dealt with as soon as possible, because birds' bones start to knit incredibly quickly, and if left for a few days, the bones become set in the wrong position and nothing can be done by then to correct that. Having said that, if the wing is only a little droopy, it could be something minor, and he may well recover his flight. If the injury is not a fracture, then the wing should not be bound. Place him on your lap, and very gently feel his wings, one with each hand, to see if you can detect any difference between them, like any swelling, scars, anything that may be present in one wing but not the other. Especially check if there are any lumps on the articulations of the droopy wing. Try to very gently extend his droopy wing, and watch out for any 'clicks' -- if that happens, there's a fracture, best not to handle the wing any more and let the vet examine him instead. If not, see whether he finds it easy to pull the wing back in. If you had noticed something in that wing that wasn't present in the other, examine that area for any wounds or puncture marks. This can be made easier by dampening the feathers in that area with a little warm water, so you can 'comb' them away and see the skin. Watch out for any dried blood, or hard yellow plasticky-looking stuff (this is pigeon pus, and would mean he needs an antibiotic to combat the infection, plus very likely the area will need to be cleaned by a specialist, as there may well be some foreign substance in the wound). Considering he had been in the spot where you found him for a few days, one of the main reasons for his lack of condition may be malnutrition, which may be compounded by worms. From your description, he certainly sounded very hungry and thirsty when you took him home. 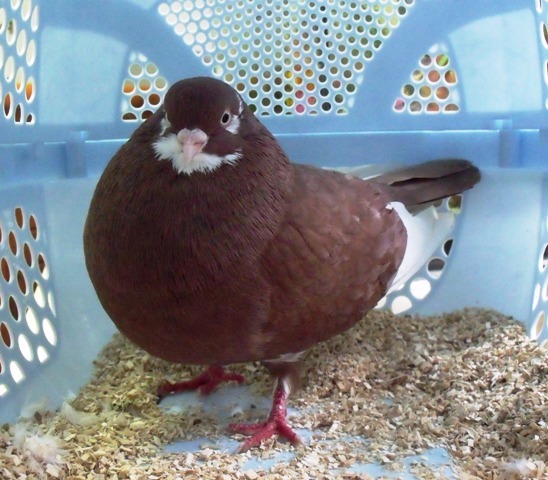 A nasty bruise can stop a pigeon from flying for a few days, and if that also makes it very difficult for him to get food, he may become grounded as he gets weaker. The test Cindy suggested is an excellent one to evaluate that. If, when you put your hand under his breast, you can feel the keel bone at all, he's too thin, to the point where some of the breast muscle has atrophied. Either way, it's always a very good idea to have a good wormer at hand, as most domestic pigeons get wormed twice a year as a precaution. You may already have one for your other birds that you could give to him too, but if not maybe you could get one from the vet, or online. At this point, a warning: don't let anyone give him Panacur (Fenbendazole) or a closely-associated wormer. Some vets still prescribe it, but that stuff invariably does more harm to the pigeon than anything else -- it's very toxic, and even when used within the prescribed safety doses, it has caused many pigeons to die. Ivermectin is the one I prefer, and it's very easy to obtain. The very best is Moxidectin Plus. Well done on all the steps you've taken so far, including making sure he had the right food, and keeping him separate from your other birds as a precaution. And, of course, thank you so much for taking him under your wing! Here are some contact details for you. I hope that helps, and please keep us posted! You must phone the clinic and the Wildlife Society before bringing a bird in. I will go through all of the health checks in a few mins, especially the ones pertaining to his wings. I once had a rat that had mange, the treatment plan for that is ivermectin as well. I took the rat to the vet and they gave him a shot of ivermectin, when she said the name I immediately recognized it but I couldnt figure out from where then I googled it and found out that it was typically used as horse wormer and I ride so thats how I knew it! The vet had told me to bring him back in 2 weeks so she could give him another shot but I looked online and found the appropriate dosage from horse to rat and just gave him that. 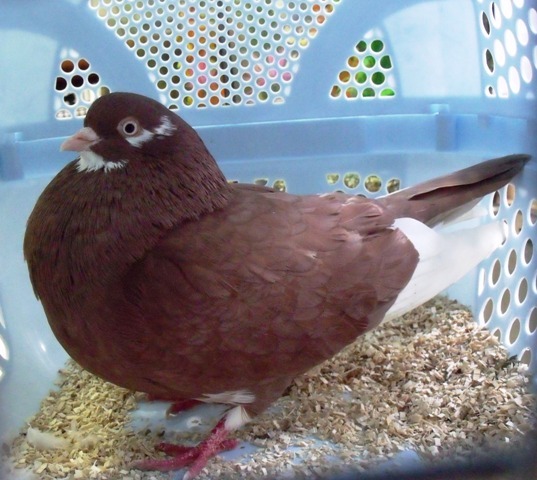 Worked like a charm, could I do the same with the pigeon in terms of the ivermectin? Wild ARC was the first place I called. They will rehab wild pigeons but will not do any sort of treatment on domestic ones if the finder wants to keep the bird, so in my case that one is out. Perhaps they should be moved under rehabs instead of veterinary. Staffed 24 hours per day. Doctor on duty until 1 am every night, on call after that. I am going to call both today to see if either will give me a discount on the examination fee. I will keep you posted on what I find when I check him out. Also forgot to mention that his droppings look fine. That's really good news, Heather, and thank you so much for the info and the other two contacts. I look forward to hearing how you get on with them. You can definitely use the Ivermectin you have for the pigeon. I also use the injectable form for cows and horses -- using that, it's 2 drops in the beak for an adult pigeon, repeated after 12 days, and 1 drop for a youngster. I just went in there and he is carrying the lower wing higher now. It is almost level with the other. I felt both of his wings and examined the underside, there was nothing different. I also extended both wings and he brought both of them back fine. I am thinking that because of this his wing was/is just a bit bruised. There have been a couple of wind storms here over the last little while so that probably has something to do with it. I released his wings and just held onto his legs so he couldn't go anywhere and brought my hand downwards and he flapped both wings. I am no longer too concerned about the wing as it seems to be coming along nicely. His food was all gone, and it was a full dish yesterday and he had drank half of his water. He is eating and drinking like a champ. Many thanks for the updates, Heather. What bothers me the most about this is that he was sitting in one spot for nearly a week, according to the store employee. That indicates to me, something is amiss. The fact that he is eating, drinking and pooping as he should be is a good sign. However, I would definitely keep a close eye on him as something caused him to be grounded. Now that he is eating, his keel bone should become less pronounced. Poor baby probably wasn't able to go searching for food before you rescued him. You are doing an awesome job with him. Thank you for the contacts. Please let us know what you find out after talking with them. I am also going to pick up some grit tonight because I don't have any yet. Should this be provided in a separate dish or mixed in with his food? Sorry to hear there won't be a discount on the vet visit. Will continue to think positive thoughts. With regard to the grit, a separate bowl is best. He will eat it as he feels the need. Wishing you both a good night!! Well the last time I went in and checked on him, around 5pm, he was sitting on the perch! That was only the second time I have seen him on it. The first time I caught him on it was yesterday morning but he was only on it for about 10 mins then I found him sitting on the ground again. This time however he has stayed on the perch for a few hours and is happily sleeping on it. Was also wondering if a vitamin supplement in the water might be a good idea every couple of days? I have "PRIME," a powdered water soluble multi vitamin, in my fridge from last year when I saved a robin from my cats. Because he is under weight and probably malnourished I was thinking it was a good way to go? How do you tell if a pigeon is male or female? I read somewhere of a case where someone put a mirror in with their pigeon and it attacked it and someone had said it was probably male because they can be very territorial? I went in to feed him and change the water a few mins ago. His wing is almost level with the other and he is not quite so fluffed up today, it actually looks like he has a neck for once! He also started cooing quite loudly when I left the room to change his water. I put a small dish of grit in with him last night and he went right for it this morning so I topped it up again. I also went ahead and added the vitamin supplement to the water figuring it would probably help him recover a bit faster. That's really good news about his wing, Heather! I think it's a great idea to give him the Ivermectin, and also the vitamin supplements, to help him recover faster. I've been thinking about the possible things that could have happened to him, according to how he is and the results of your examination. Something brought him down, that's for sure. And something stopped him from moving for a few days. But what? Some diseases can certainly ground a pigeon, but most of those show other symptoms, notably altered droppings. The scariest one can be ruled out: pseudomonas infections can result from even the tiniest cat scratches or bites, and they usually kill a pigeon in 72 hours. If he had been infected, he wouldn't have been alive when you found him. With no obvious sign of disease and no visible injuries, I would hazard a guess that he hit something in bad weather, probably a building, bruising his wing and getting concussed. The concussion would have grounded him, and the time spent outside in the cold would have been beneficial to heal the concussion, but in the meanwhile he became weak from lack of food. Have a good look at his head and face, Heather, and see if it is perfectly symmetric, if there are any feathers missing or damaged, or the eyes look at all swollen. See also if there are any hairline fractures on the beak. If this is the case, he shouldn't be placed on a heating pad or near a source of heat until the blood circulation to his head returns to normal. Have a look inside his beak too -- the inside of his mouth and throat should be pink (red or grey are indicative of a problem), there should be no strings of mucus and no white or yellow growths. If you see any of these, please let us know. Well done on taking such great care of him, you're awesome!!! I would hazard a guess that he hit something in bad weather, probably a building, bruising his wing and getting concussed. That is what I am thinking also. We had winds up to 90km/h on and off for a few days leading up to when I found him. Visually everything looks fine except for the fact that he is carrying that one wing a little lower again today. I am taking the fact that he had it up for a couple of days a good sign, at least I know he can hold it there for a while. Hopefully he will start to carry it up permanently soon. It is still held higher than before, but not by a lot. I got the battery for my scale yesterday so I am going to weigh him in a bit. I will then wait a couple of days to weigh him again to see if/how much improvement there is. I put him in the small blue carrier to take his weight while I was cleaning his large one and snapped a couple of photos. He currently weighs 284 grams, is that good? Bad? Not really too sure what the average weight is for a pigeon his size. Also I have been looking at pics online and think he is probably a roller, what do you guys think??? In this second one he has it down again and this was taken about 30 seconds after the first. This one was just because he was looking good! Sorry about the delay, I haven't been too well. 284 g is on the thin side... he must have put on quite a bit of weight since you found him, so he must have been really starved when you found him, poor thing! Average weight for an adult pigeon is 300-330g for that size. He's a beauty! He may well be a roller, but I don't have any rollers, so I'm not the best person to answer that, but he does seem to have the characteristic shape. That would also add weight to the possibility of a collision in flight, as rollers effectively stall in mid air when they do those loops, and a strong gust of wind could have thrown him against something. On the other hand, rollers have also been known to not be able to pull out of the steep descent and fall to earth. I wish there was a way you could get that wing X-rayed without paying an arm and a leg, but the fact he's able to hold it up now and again is a very good sign indeed as I've never seen a bird with a broken wing do that. Thats ok Teresa :) I have been a bit under the weather my self. There is a cold circulating around my work as well as strep, thankfully I dont think I have the later haha. I am going to clean his cage after dinner so I will take a current weight on him in an hour or so. For him to still be under weight after having food available to him for several days, back when I took his weight, he probably was starving. Do you think that he could have been grounded, and the muscles in the wing affected, because of muscle mass loss due to starving? He is holding that wing up more and more as the days go by. I am thinking about making him a flight cage out of some square mesh panels I have. That way he can exercise for an hour or two a day to build up lost muscle. Is this a good idea or should I let the wing come along a bit more? Thanks a ton by the way I would be rather lost without your help! 316 grams! Thats 32 grams in 4 days! Good to know he is packing on the weight Can still feel the keel bone but not so prominently. It will be interesting to know what his weight is once I can no longer feel the keel bone when he is now right in the middle of the average 300-330 grams. I just did some math, assuming he gained more weight per day in the first few days (as my research would suggest is likely) and is slowly has been tapering off, he was probably a bit under 200 grams when I found him :( poor bugger! Fantastic!!! He's putting on weight so quickly, that will help him lots in regaining his fitness! Being grounded for a few days wouldn't have atrophied his flight muscles to that extent, though prolonged starving causes a lot of muscle wastage, but that's in both wings. I still think he definitely injured his wing, but with a bit of luck it may just be a bruise, and as the pain eases off he will use his wing more and more. I don't think his movements need to be restricted, so it would be great if he had a chance to exercise his wings a bit every day -- he will know how far to take it, pigeons are just amazing! You're doing an amazing job!!! Thanks I should be able to start construction of the outdoor cage at the end of the month and it should only take my boyfriend and I a weekend or two to get it done. Wow, you two are clever!!! Can I adopt you? LOL! I really only think it will take us the weekend, one day to finalize measurements and buy the stuff/cut it, and another to put it together and paint it. I want the paint to fully cure before I put Dubbs in there so he wont get to go in it till the following weekend. We are going to take pictures as we build and post them. It took us three weekends to build a custom enclosure for my snakes with vinyl background, glass floors, and acrylic doors. It houses three snakes. Much more complicated than a pigeon house made of wood and mesh :P The only thing that might take us some time is getting all of the cuts right for the angled roof. He seems to be doing very well. Holds the wing up on a much more consistent basis now. I also think/hope he is molting :P I am finding feathers in there ever day now. The reason I believe he is molting and not plucking is because I see some nice pin feathers popping up all over and I have not seen him pluck.